Ideal for the simultaneous analysis of mixed sample such as alcoholetc. InertCap for Amines shows excellent performances for the amine compounds from C2 ~ C10. Basic compounds can be perfectly eluted without being adsorbed in the column. 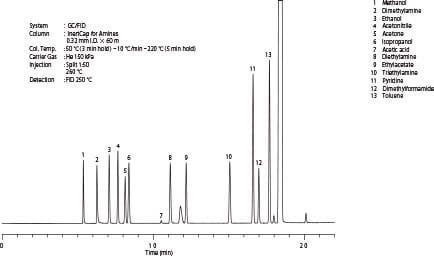 Unlike other special columns for Amines, InertCap for Amines can analyse general solvents such as alcohol along with amine compounds simultaneously. That was enabled by the unique neutral inert treatment technique of GL Sciences. For different dimensions please contact us. More information about ProGuard or Transfer Line.